WHAT: At a special State Board of Education meeting, board members will consider possible action on a process to approve non-traditional routes to special education teacher certification and adoption of state policies for Special Education – Individuals with Disabilities Education Act (IDEA). The board also will consider possible action on the fiscal year 2014 education appropriation in addition to other items. Click here to see the full agenda. WHERE: The Oliver Hodge Building, 2500 N Lincoln Blvd., Suite 1-20, Oklahoma City. The State Board of Education's regular monthly meeting will be at 9:30 a.m. Thursday, June 27. OKLAHOMA CITY – A bill signing ceremony for House Bill 1989, the Student Data Accessibility, Transparency and Accountability Act (Student DATA Act), was held today at the State Capitol. This new law establishes Oklahoma as a leader in student privacy. The bill establishes new procedures and safeguards for the collection and use of student data by our public school system. The Student DATA Act requires the State Board of Education to publicly set policies and establish safeguards for student data collected by the State Department of Education. Student data privacy has been handled largely at the staff level within the Department. The law establishes new, strict limits on the transfer of student data, including de-identified data, to federal, state or local agencies or organizations outside Oklahoma. It further restricts the Department from requesting delinquency records, criminal records, medical and health records, social security numbers and biometric information as part of student data collected from districts. Gov. Mary Fallin praised the successful effort to pass HB1989. Rep. David Brumbaugh, R-Broken Arrow, was the principle author of HB1989. “Over time, I have been hearing more and more from parents about the data schools gathered about our children, what data was passed on to the state and federal governments and how that data could be used – and by whom," said Rep. Brumbaugh. "These concerns are what prompted me to author this bill. The Student DATA Act is the critical first step in developing a set of comprehensive and strict privacy controls on student data collected by Oklahoma's public school system." 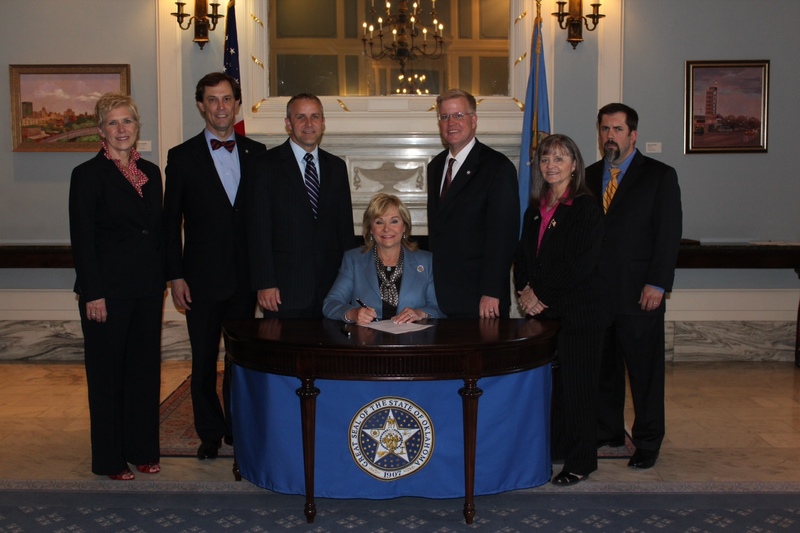 Rep. Jason Nelson, R-Oklahoma City, a House coauthor, helped draft the language of HB1989. "As a parent of two children in public schools I know it's important for educators to keep records on students so they can do their jobs," said Rep. Nelson. "But, as a parent I also want the information handled appropriately. Now that the Student DATA Act opens the student data collection process to the public, everyone has the tools to help make sure there is an appropriate balance between having critical information about students but not collecting more data than is absolutely necessary while protecting such sensitive information." Sen. Greg Treat, R-Oklahoma City, the Senate author, noted it is rare for a bill dealing with education to get such overwhelming support. "I was pleased to work with these individuals who have diverse perspectives on education," said Sen. Treat. "Everyone came together to protect student data privacy." The new law addresses the growing need to protect more fully our children’s privacy as the State Department of Education works with districts to expand teacher access and use of data for the purpose of improving instruction to increase student achievement. Rep. Jason Murphey, R-Guthrie, a House coauthor, highlighted the importance of transparency about data collection. "The new law creates additional transparency," said Rep. Murphey. "For the first time, the process for protecting student data will be required to be open to the public. Being open with the public is the best way to avoid problems in the future." Sen. Clark Jolley, R-Edmond, Senate coauthor, said the law protects student privacy while allowing essential data to be used for accountability purposes. Superintendent Janet Barresi called the new law a well thought out approach to protect student information. “The Oklahoma State Department of Education has been working with local administrators and teachers to determine what data they need from the state to improve student learning," said Supt. Barresi. "As more data are made available to classroom teachers, the state needs thoughtful and transparent rules about who can access the data and how it can be used." It is anticipated this new level of transparency will lead to a healthy public debate about the proper role and scope of data collected on the State's public school students. With the level of detail now available to the public, concerned Oklahomans will have the information necessary to better guide policy makers in decisions regarding the sensitive issue of information collected on students. As lawmakers, we look forward to a public conversation on this issue and expect to run additional legislation in the future to build on this foundation. HB1989 received near unanimous support, passing the House 88-2 and the Senate 41-0. The bill was signed by Gov. Fallin on May 29th and becomes effective July 1.
requires the Board to make annual reports to the Governor and Legislature. further restricts the Department from requesting delinquency records, criminal records, medical and health records, social security numbers and biometric information as part of student data collected from districts. OKLAHOMA CAPITOL -- The Oklahoma Council of Public Affairs has released a new ten minute documentary following up with three students with special needs who have been using the Lindsey Nicole Henry Scholarships for Students with Disabilities Program Act for the last year. Lindsey Nicole Henry Stories, Part 2 takes a look at how Chloe, Rob and Phylicia are doing after they were featured in a powerful twenty-five minute documentary released a year ago. The benefits of the program have exceeded my expectations.